Whey Protein is vital irrespective of any nutrition routine, aiding in the provision of a means for the body to ensure protein synthesis as well as muscle development. Far advanced as compared to various protein supplements, such a carefully developed formula will aid in offering a person’s body with the pure top-notch quality protein that is needed to assist in fuelling their muscles while ensuring recovery. What is Whey? How is it Beneficial? A majority of top athletes ensure that Whey Protein is their foremost choice as far as after-workout muscle recovery is concerned. MuscleXP 100% Whey Protein can be considered an all-inclusive protein, which means that it offers the entire set of Essential Amino Acids which can only be consumed via a diet, and digests at a fast rate to help set in motion the recovery phase . 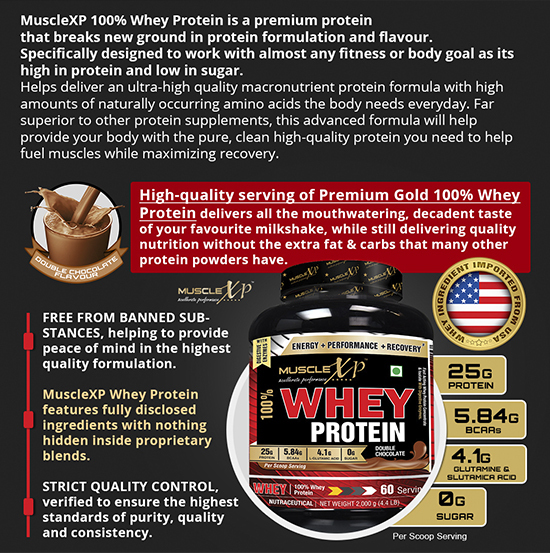 MuscleXP 100% Whey Protein is thus an all-whey product that is fused with Pure Whey Protein Isolate. 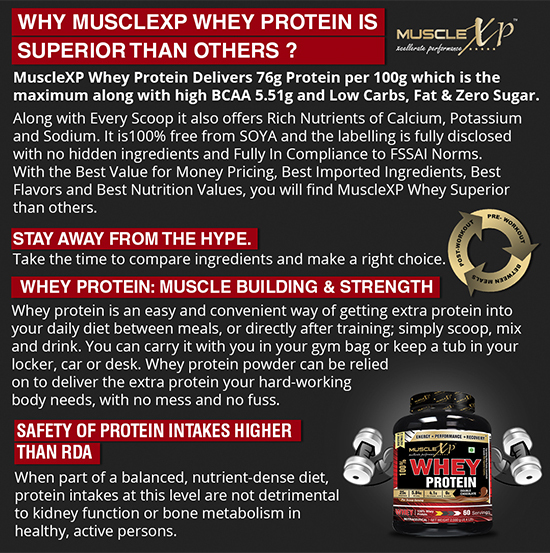 Why Use MuscleXP 100% Whey Protein – 2Kg (4.4 lbs), Double Chocolate – The New Whey Standards? Fast-working Whey Protein Isolate as well as Whey. Concentrate can safely be considered the topmost Protein source. Is inclusive of Ultra-Filtered Whey that contains minimal cholesterol, fat as well as sodium. It has 5.84g of Naturally Derived BCAAs for every serving and 4.13g L-Glutamic Acid. It is inclusive of Digestive Enzymes that aid in quicker absorption. Quick use with easy mixing with a Glass and a Spoon. Fast assimilating Whey Protein Blend aids in quickening amino acids provision to help with muscle-recovery post workouts . Quick-acting Whey Protein Isolate along with Whey Protein Concentrate can be termed the foremost Protein resource. It has established New Gold Standards – 116.85 kcal Energy, 25g Protein, 0.85g Fat, 0g Sugar, 0023g Trans Fat for every 33g Serving. It also contains ZERO SUGAR! The product contains an elevated protein percentage (25g of protein, 88.45% of Whey protein as far as weight is concerned). It is also fortified with Calcium, Sodium, Potassium as well as Amino Acids. It contains Ultra-Filtered Whey that brings about less cholesterol, fat and sodium . It has 5.84G BCAA’s as well as 4.13g L-Glutamic Acid. It also has a rich double chocolate flavour that can be mixed promptly with the help of a Glass and Spoon.Its components include Whey Protein Concentrate 80% and Whey Isolate 90%, which are acquired from the USA. The commodity is manufactured with the use of a facility that has World Class International Manufacturing Standards (which include WHO GMP, ISO 22000 : 2005 from TUV-SUD, Germany, ISO 14001 : 2004 from TUV-SUD, and Germany, National Sanitation Foundation (NSF International USA). It must be noted that MuscleXP Brand is under the ownership of Emmbros Overseas Lifestyle Pvt Ltd. Spanning varied online sources, the orders will be provided directly by the organisation and thus are 100% original. No MuscleXP item has any printed foil in the package. Nevertheless, each package has a MuscleXP Printed Foil on the exterior of the jar. This is the best quality whey protein. It is easy to digest. Loved the rich chocolate flavor. I’m taking this product for a few weeks. It’s delicious. The quality of the protein is good and it is easily digestible. I like the rich chocolate taste of the whey protein shake. The quality is really good and I could feel the difference in a short time. The perfect product for meeting the extra protein need for building muscles. I am taking this whey protein powder for 2 weeks. It mixes easily with milk and makes delicious shakes. It is filling. There was no digestion issue. Top grade whey protein. Excellent blend of whey isolate and concentrate that ensures that I get the best quality protein for post-workout muscle recovery and growth. Delicious chocolate protein powder. Good satiety booster. Keeps me full and energized. Best quality whey protein powder. The ingredients list shows that it contains everything that one needs from a whey supplement. Personally I think it is helping me in muscle development. MuscleXP 100% Whey Protein is your instant supply of protein. This means that if a person forgets to bring their shaker cup or is running short of time to use the blender, they can simply just add one full spoonful of MuscleXP 100% Whey Protein to their glass that contains 6-7 oz (200 ml approx) of water, or low fat milk or even their regular beverage. After this, it can be mixed with a spoon and stirred for about 30 seconds or till the time the powder is entirely dissolved. As a helpful tip, a stronger flavour can be obtained by mixing a scoop with 5 oz (150 ml) of water, or milk or a regular beverage. In order to consume a milder tasting drink, a person can use 8-10 oz (275 ml approx) of beverage per scoop.